In this part of al3a2ida how will Maysam get her revenge from rachid khattar, and will she marry ziad jabber after she discovers that the father of her unborn baby is deceased? Sanaoud Baad Kalil is a Lebanese and Syrian drama series related to the Syrian crisis with a humanitarian angle highlighted through the family of Najib. The story revolves around Najib as he decides to visit his family in Lebanon after leaving his house in Damascus and suffering from a health set-back. He will soon discover that his children are living a life far more different from the one he expected them to lead. Al Chahroura is a Lebanese Television series that tells the story of Lebanese Star Sabah on both personal and artistic levels from the age of seventeen until now. This series depicts the life of Jeanette Feghaly known as Sabah and nicknamed “Chahroura” for her beautiful voice and charismatic presence discovered by Asia Dagher (Carmen lebbos). It showcases her life objectively from all angles especially when it comes to the hardships she dealt with during her life in Lebanon and Egypt as well as her relationship with her children and her many marriages. Al-Kinaa is a Lebanese series revolving around the life of a rich real estate mogul named Majdi who spends his time between Lebanon and Africa. While on business in Africa he is targeted in an explosion and the news of his death is sent to his wife Nahed (Carmen lebbos), his family and his business partner Achraf. The lives of these three characters evolve in a mix of romance, action and excitement. Salam is a journalist, whose commitment towards her family keeps her away hinders her love life. However, things change when she meets a young director, Adonis. Staring: youssef el-khal, elie metri, pierette katrib. Kinda is a drama series that revolves around a famous journalist who faces betrayal and divorce as well as her fathers’ battle with cancer, but still fights for a better life. The series revolves around the story of maysam abboud who gets out of prison, after having served her time, with an urge for vengeance against those who set her up. After seventeen years, Maysam confronts Amer Kheir’s Family who were behind her misfortune, she is also shocked by two marriage proposals but does she still believe in Love? And how will her friend “Amar” help her change her fate? Staring: fadi Ibrahim, sultan deeb, randa kehdi. The series is about Ismail Yassine (the famous egyptian comedian). His life , beginning and various challenges. 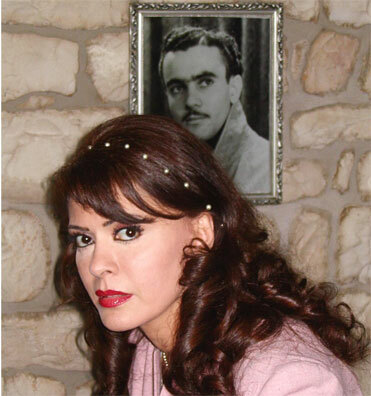 Carmen played the role of Badiha Massabni. This TV series, Carmen plays Arwa, it is about a Palestinian family living in Egypt. They encountered major problems following a visit to Gaza. Carmen plays Catherine a french lady that got married to an Egyptian and lived in Marseilles (France). When the two daughters grew , the discrepancies between cultures appeared and problems started. Bayn Beirut wa Dubai is a Lebanese drama series which takes place in both Beirut and Dubai cities and revolves around the Love and Hate Saga between walid and Amal (Carmen lebbos) , the rich but barren woman who made him a wealthy man and who seeks revenge after discovering his marriage to Nahed, the woman who gave him children. This is a series about how the Society cannot accept the love of a couple having a difference in age, notably when the woman is older than the man. Tells the story of “May”, who inherited her father’s school located in a small town, as well as his values. May tries to sustain the school in respect of her father’s dream and is hunted by an old love story with Ziad. The story of Khedive of Egypt and Sudan (1863 - 1879) The grandson of Muhamed-Ali pasha was born in Cairo. After he received his education in Paris, he returned back to Egypt to become the Wali and Khedive of Egypt and Sudan. Being raised and educated in Europe, he greatly modernized Egypt and Sudan during his reign. "Egypt is no longer in Africa, we are a part of Europe" he said. Al ikhwa is a pan-Arab drama series that revolves around five siblings adopted by Farid Nouh, a rich man who could not have children. Problems begin when Mira shows up with her mother claiming that she’s Farid Nouh actual daughter. Starring: Taym Hassan, Bassel Khayat, Amal Bouchoucha.